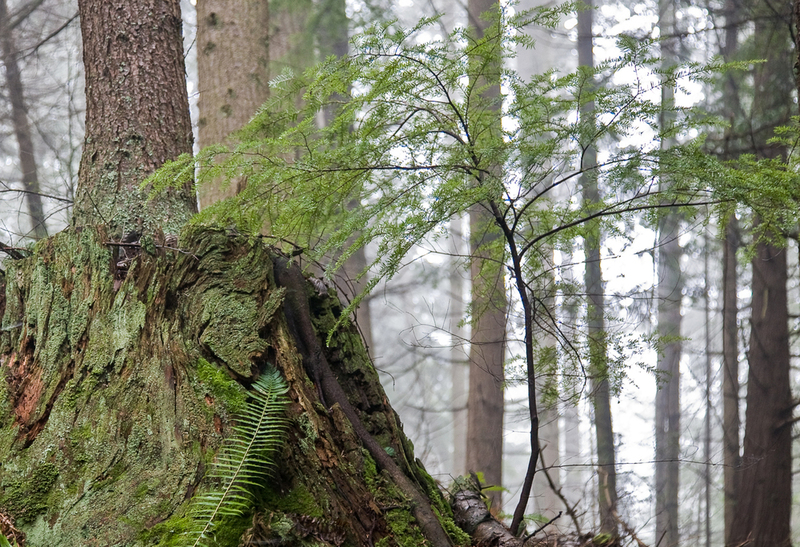 The 2,800 total acres in the ACFL area on Fidalgo Island have been conserved through the generosity of many local residents to ensure that the land will continue to be maintained as a natural forested area for hiking, biking and trail riding. Below are some of the views along ACFL trails. See Trail Guide on this website for photos and detailed descriptions of individual trails. You can purchase trail maps at the same Anacortes stores where you can purchase NeuVue calendars: Watermark Books and Lake Erie Grocery. Proceeds from past NeuVue calendar sales have preserved 3.2 acres of Anacortes Community Forest Lands, and calendar sales in the past two years have supported Friends of the Forest, the keepers of our forest legacy. Get out and experience Anacortes Forestlands first-hand, and enjoy! Park at the Mount Erie Summit trailhead, then cross the road and take the trail less traveled. It's an easy hike through the forest before you reach reach a rocky spot that overlooks Lake Erie and the San Juans beyond. Take an easy stroll along the forested path with Heart Lake in view along most of the trail.